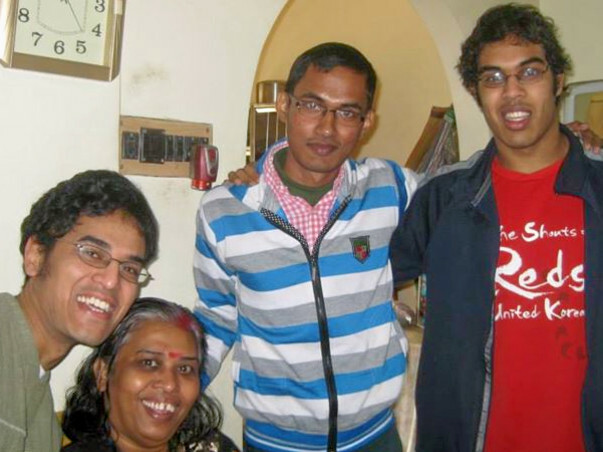 Rishab Ghosh is a loved member of our family who has unfortunately become a victim to cancer. He is a bright and intelligent 2nd year electrical engineering student at Jadavpur University, Kolkata, continuing his college studies through the Foundation for Excellence Fellowship and the Vivekananda Scholarship in India. Rishab was diagnosed with Mediastinal Non-Seminomatous Germ cell Tumour in July of 2014. As of now, his life critically depends on continuation of treatment with chemotherapy and bone marrow transplant (BMT). Bone marrow transplants are very expensive, and will cost $38,000 USD or 25 lakhs INR.Unfortunately, his parents are poor and they have spent all of their life savings for his chemotherapy and other medical expenses for their only child. For further medical expenses, he now depends on relatives, friends and kind donors like you. Rishab is now having chemotherapy and would undergo radiation therapy later this fall at CMC Vellore. This will be followed by BMT, once this fundraiser goal has been met. He needs to undergo bone marrow transplant (BMT) urgently. If you are interested to be a BM donor and it matches closely with that of Rishab that will be wonderful. Rishab plans to continue his studies and become an electrical engineer after he is rescued from Metastatic Germ-Cell Tumour. He looks forward to your help. Your support to battle against Rishab’s cancer will be greatly appreciated. P.S. 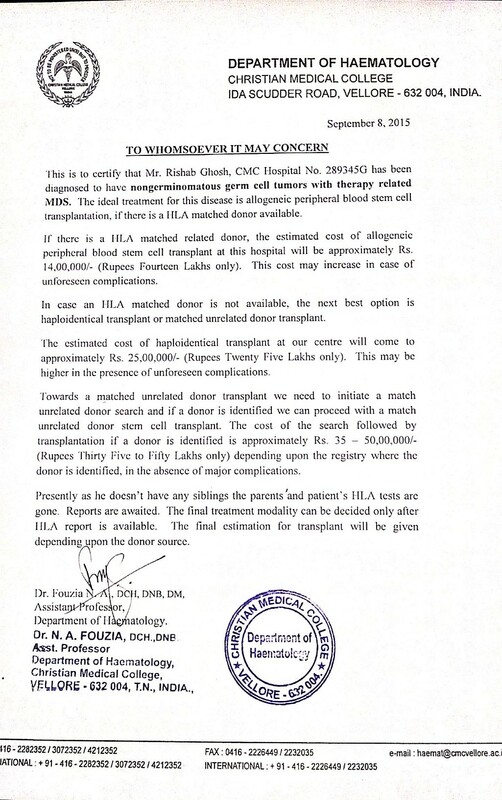 : A copy of the Certificate of Estimated Expense for the bone marrow (BM) transplant and other details are attached to this site. You can do this by entering the amount you want to donate in either $US or INR on the top right and click contribute. Note! !, after clicking the the contribute button, As required by Indian law you will have to log-in with either a facebook, g-mail, or create a Milaap account. After log-in fill out your remaining card information. It truly breaks our heart to have to say this: Rishab Ghosh has passed away. 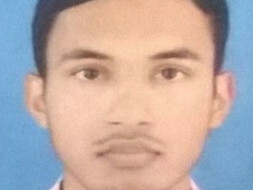 At age 21 he died last night at 1:45am in the Applo Nursing home in Kolkata. Rishab and us always had strong faith that he could recover from this, but unfortunately that was not in the cards. As an only child his immediate family is incredibly devastated. If you are in Kolkata and would like to reach out to his family please do. Rishab was a very bright happy quiet kid that we will all truly miss. Thank you so much for all your support. You all are incredible, and in Rishab’s time of need you all showed up, every single one of you. We spent a fair bit of your donation in the initial stages of his medical treatment, But we will try to refund your donations to the best of our ability, and we will be getting in contact with you individually in the next week. 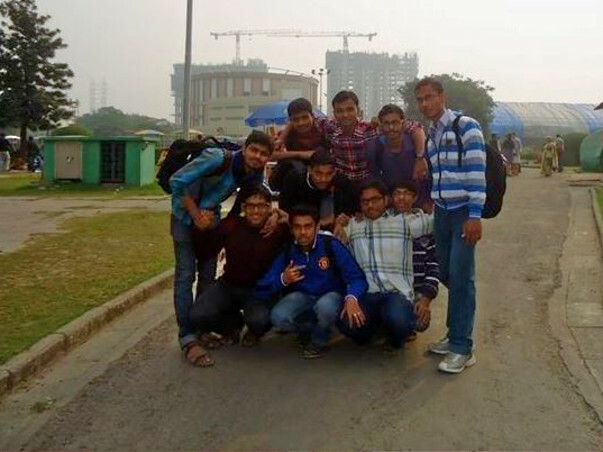 Rishab has returned back to Kolkata after finishing his medical treatments in CMC Vellore. Unfortunately he is in very poor health. The cancer has spread even further than we had expected, and at this moment he is unfit to undergo any more medical treatment. If you are in Kolkata, and would like to visit and support him and his family in this difficult time, please do so.